While the governor did unveil an aggressive ethics agenda during his State of the State speech a week later, Cuomo’s words ring hollow now, as a state budget containing no government ethics reform passes and any hope for such reform happening this year is pushed to the legislative session, where it is unlikely to occur. Just about a month after two of New York’s most powerful legislators were convicted of several federal corruption charges in separate trials, Cuomo laid out a plan to close the LLC loophole, which allows limited liability companies to circumvent New York’s campaign donation limits and give large sums of money to candidates through various LLCs, limit the amount of outside income legislators may earn, and adopt a publicly funded campaign finance system, among other reforms. Yet, as negotiations for the state budget come to a close, the “three men in a room” deciding the state’s roughly $150 billion budget have not moved ethics reforms that could help give the people they serve “the government that they deserve.” In a Siena College poll released Feb. 1, 89 percent of New Yorkers said corruption in state government is a serious problem, with 60 percent calling for outside income to be banned. Although Assembly Speaker Carl Heastie, a Democrat and one of the “three men in a room” along with Gov. Cuomo and Republican Senate Majority Leader John Flanagan, has pledged to “increase transparency and accountability” and “restore the public’s trust in government,” the lack of any ethics reform in the state budget calls Heastie’s follow through on that commitment into question. “The Assembly has pledged to enact comprehensive ethics reforms, and we take that commitment very seriously,” said Heastie in a press release detailing the ethics reform component of the Assembly’s budget plan, which was released Friday evening March 11. Like Cuomo, Heastie outlined an ethics reform agenda, but did little else to publicly promote it. On that Friday morning three weeks ago, Heastie outlined the Assembly Democrats’ ethics package at an event held by Crain’s New York Business. The plan also includes a proposal to close the LLC loophole, as well as proposals to limit the amount of outside income legislators may earn (though not as strictly as Cuomo’s plan), and to make it so that legislators who also work as attorneys can only earn money for the casework they perform, rather than for simply serving as "of counsel," lending their name to a law firm - a practice at root of the scandal that brought down Heastie's predecessor, Sheldon Silver. Both Silver and former Senate Majority Leader Dean Skelos were brought down last year by corruption convictions related to their use of their public offices for private gain. The new head of the Republican-controlled Senate, meanwhile, has repeatedly questioned the need for further ethics reform, and he and many other Senate Republicans are opposed to making the Legislature full-time or placing any limits on lawmakers’ outside income. 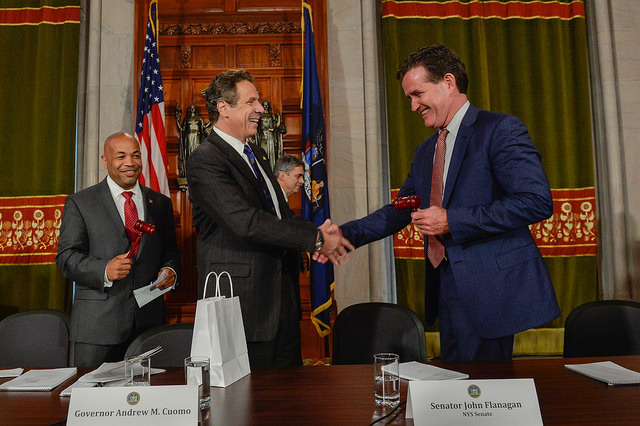 Sen. Flanagan has previously pointed out that the Senate passed a pension forfeiture bill, aimed at ensuring that legislators convicted of public corruption cannot collect a government pension, in a deal with the Assembly, only to have the Assembly back out at the last minute. Pension forfeiture is notably absent from the Assembly's reform plan. As the New York Times Editorial Board writes, “In Albany, this is how the stage gets set for each legislative house to praise itself and to blame the other for the failure, yet again, of meaningful reform, and for Mr. Cuomo to blame them both. New Yorkers, legislators, and government reform groups alike say that ethics reform is essential, “especially considering the context of the past year,” as Cuomo himself said during his State of the State. Yet at a time when Cuomo has the most leverage, he has failed to achieve reform. Heastie has decided not to aggressively pursue the Assembly's plan, and Flanagan has appeared totally disinterested in the issue. The minorities in each house - one Democratic, one Republican - have actually been more vocal than the majorities. Senate Republicans’ resistance to outside income limits and closing the LLC loophole have left room for Cuomo and Heastie to play a blame game. In part because neither did anything beyond one speech to promote ethics reform leading up to the budget, there is room to question their seriousness. But, Senate Republicans have, it seems, let the two Democrats and Assembly Democrats in general off the hook. “It is incumbent upon legislators to work to significantly reduce corruption, and we can do so by passing these common sense measures,” Assemblymember David Buchwald said upon signing a pledge to fight for good government reform, including closing the LLC loophole. “I think the vast majority of New Yorkers would want to see their representatives sign this pledge. "In recent times, the New York Legislature has been marked by regular bribery, rampant kickbacks and a rancid culture," U.S. Attorney Preet Bharara, who prosecuted both Silver and Skelos, said during a talk in Albany in February. A coalition of government reform groups, including Citizens Union, Common Cause, the League of Women Voters, the New York Public Interest Research Group, and Reinvent Albany, released a statement denouncing the governor and legislative leaders for failing to pass any ethics reform in the three-and-a-half months since former legislative leaders Skelos and Silver were convicted of corruption, despite strong public demand for action to be taken. When Cuomo was asked in February whether ethics reform were likely to remain in the budget, the governor replied, “As we get closer and actually have budget conversations, it’s going to be at the top of the list.” Not long after, Cuomo conceded that ethics reform would not be included in the budget. Legislators from the minorities of the two houses lamented having little time to review the bills and the fact that most of them were short any real policy decisions and featured sections marked "intentionally omitted." After weeks of haggling, bursts of information, and rumors, Cuomo announced some hard numbers contained in the budget, just a few hours before the start of the new fiscal year. The governor happily announced that New York would see a phase-in of a $15 minimum wage and a paid family leave program. He appeared less thrilled when admitting his proposed Medicaid cost-shift to New York City was not part of the budget (this after his CUNY cost-shift had been taken off the table a few days ago). "I am very excited about this budget," Cuomo said. "We call it a budget – really it is an overall operating plan for the state of New York and I believe that this is the best plan that the state has produced, if its passed, in decades, literally." 8:30 p.m: scheduled time of Gov. Andrew Cuomo's announcement of a budget deal; 3.5 hours before the start of the new fiscal year. $147 billion: estimated size of the state budget. 0: legislative leaders present at Cuomo's budget announcement. 0: times Republican Senate Majority Leader John Flanagan mentioned a minimum wage increase or paid family leave in a seven-paragraph statement put out by is office to celebrate the budget agreement. 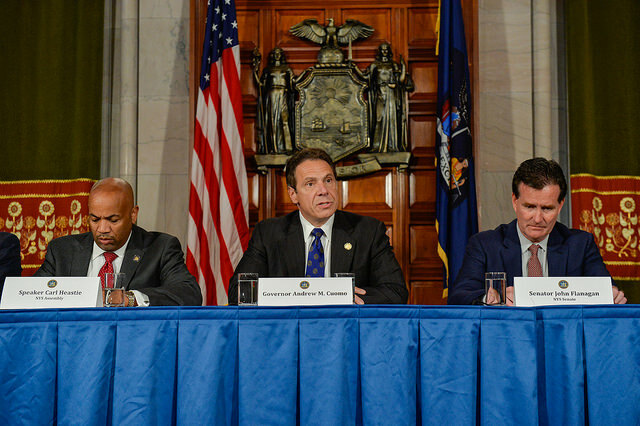 4: men who controlled budget negotiations (Cuomo, Flanagan, Heastie, and Klein). 3: budget bills introduced to both houses to be voted on before a deal was actually announced. 3 p.m: time the Assembly started debating the first budget bill, without a deal announced. 4 p.m: time the Senate began debating its first budget bill, without a deal announced. 6: budget bills left to vote on after a budget deal was announced. 12/31/2018: date New York City will see its minimum wage hit $15 per hour for businesses with more than ten employees. 12/31/2019: date New York City will see its minimum wage hit $15 per hour for businesses with ten or fewer employees. 12/31/2021: date Long Island and Westchester County will see the minimum wage hit $15 per hour. $12.50: hourly minimum wage localities north of Westchester will reach on 12/31/2020, at which time the state budget director and department of labor will set a path to $15 per hour. 2: years in a row the state budget has been voted through after the March 31 midnight deadline and thus technically "late." 6.5%: increase in school aid, which totals $24.8 billion. $240: increase in per pupil aid for charter schools. 12 weeks: length of new New York paid family leave benefit, for paid time off to care for a new child or ailing relative. 50% of an employee's average weekly wage, capped to 50 percent of the statewide average weekly wage, is where paid family leave pay will start. When fully implemented in 2021 it will be 67 percent of an employee's average weekly wage, capped to 67 percent of the statewide average weekly wage. 6: months workers will have to have worked at a job before being eligible for New York's paid family leave. $26.6 billion: amount the budget includes for capital facilities operated by the Metropolitan Transportation Authority (MTA). $1.5 billion: marked for phase II of the Second Avenue Subway. 63: copies of a report detailing changes made to the executive budget that Senate Republicans had to have printed off for Senators after Sen. Liz Krueger pointed out the report was required by law. $485 million previously proposed cost shift to New York City for CUNY funding. $250 million Medicaid cost shift to New York City. A plan to replace the 421-a property tax credit used by New York City to entice developers to include affordable housing in their developments. $240 million initially sought by the Cuomo administration to give CUNY staff retroactive raises. 0 criminal justice proposals from the executive budget included in the final budget. A budget is due by midnight Thursday, with the new fiscal year beginning on Friday, April 1, but a deal must be in place sooner so that bills can be drafted and voted on. The legislative session then extends into June. Cuomo and legislative leaders said Tuesday that they were getting close to settling the major funding and policy differences that would be included in the budget, with no mention of criminal justice issues. For some advocates it is no surprise given the complexities of their issues, like the push to raise the age of adult criminal responsibility in New York and legislation to amend state law to create a special prosecutor to preside over investigations of police killings of civilians. To others, it isn't surprising for an entirely different reason: they are used to seeing Cuomo pitch major criminal justice reforms during his State of the State address only to abandon them during budget negotiations due to push back from Senate Republicans. "For years we've seen this pattern where the governor comes out with big bold ideas in January but he doesn't follow through," said Alyssa Aguilera, co-executive director of VOCAL-NY, a community organizing and reform group. "We know the governor is very powerful and can move things when he wants to. He should be acting on these issues that really impact the low-income communities of color who are really his base." The Cuomo administration did not return request for comment. Legislators who support criminal justice reforms say they've been focused on the budget and won't likely return to other legislative issues until next week. Aguilera noted that Cuomo has previously pitched decriminalizing small amounts of marijuana only to abandon the issue. Last year Cuomo dropped "Raise the Age" and legislation to create a special prosecutor to investigate police killings of civilians during budget negotiations. He has also previously abandoned a push to provide inmates with a college education. However, last year while facing pressure to act from family members of the deceased, advocates, and legislators, Cuomo issued an executive order giving Attorney General Eric Schneiderman the ability to investigate police killings of civilians under certain circumstances. The order allows the Attorney General to investigate any case involving a police killing of a civilian and to take over a case from a local District Attorney. 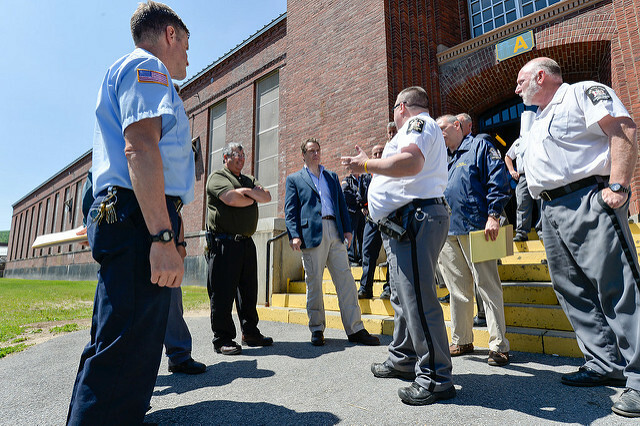 The bill Cuomo is backing this year would allow an independent monitor to look into cases if a grand jury decided to not move forward against an officer or if a District Attorney did not put the case before a grand jury in a "reasonable" time. The monitor could then make a recommendation to the Governor. The Attorney General would no longer have a role. Advocates see the proposal, which is not garnering momentum, as a substantial weakening of Cuomo's executive order. Aguilera said she is concerned the current environment might not be ideal for getting the special prosecutor bill her group supports. "Our biggest fear really is seeing a rolling back of our victory. We fought for the executive order which was a very good, solid executive order. We are realistic that the current leadership in the state Senate means it might not be the right time for a stronger bill. We need to protect the current executive order. We don't want to see a watering down of what we already have," she said. Supporters of the plan to raise the age of criminal responsibility in New York are more optimistic about their chances. New York is currently one of just two states, with North Carolina, to try 16- and 17-year-olds as adults. "I think it's going to be a priority for the governor once other priorities are taken care of," said Paige Pierce, CEO of Families Together New York State. "We aren't surprised or unhappy it is being dealt with outside of the budget. We want the attention paid to it that it deserves." The issue of how to treat 16- and 17-year-olds in the state's criminal justice system is complicated. Senate Republicans don't want to be soft on crime, or give the appearance of being so, while Assembly Democrats want to provide a host of alternatives to criminal court. Lawmakers and advocates say that last year they came close to compromise legislation. "We got so close last session, we just ran out of time," said Stephanie Gendell, associate executive director for policy and government relations at Citizen's Committee for Children of New York. Gendell said that legislators from both sides of the aisle were motivated to deliver on legislation when they heard details of how 16- and 17-year-olds were treated. "Certain pieces of Raise the Age just aren't controversial to anyone. That's why we got so close," said Gendell. "Legislators were surprised to hear that a 16-year-old arrested can be held all night without parental notification, without anyone knowing. The more people learn the more they are motivated to act." Cuomo did push last year to leave funding in the budget to enact Raise the Age reforms were a deal reached, and that money was there, but no deal occurred. The governor included similar language in this year's executive budget. Advocates are anxious to see if the language makes the final budget bills, setting the stage for an agreement in the months ahead. Cuomo also has bail reform on his agenda for the legislative session ahead. The governor, Democratic Assembly Speaker Carl Heastie, and Republican Senate Majority Leader John Flanagan continue to negotiate the budget framework. With no legislative deal reached last year Cuomo took executive action, placing all 16- and 17-year-old inmates in an alternative facility. He followed up by pushing the issue again in this year's State of the State address. The Assembly put forward its own version of the bill in its one-house budget. Senate Republicans have indicated some interest in compromising on reform legislation. "Part of why this doesn't get passed in the budget is that it is a very comprehensive piece of legislation," said Gendell. "Out bill is very long and there is a lot to it. When we get to legislative session we can talk more about the details. Senator Flanagan said he didn't want to deal with Raise the Age in the budget, he didn't say he didn't want it to happen at all." A new state budget is due by midnight Thursday, with the state's fiscal year beginning Friday, April 1. There are several areas of budget concern for de Blasio and others who represent New York City, including Heastie. On Monday, de Blasio repeatedly cited Heastie and the Democratically-controlled Assembly as essential allies in the fight to protect city interests throughout negotiations. At an unrelated press conference at 1 Police Plaza, Gotham Gazette asked the mayor what he is watching for as state lawmakers negotiate the final details of a $140-plus billion budget. While expressing frustration about the lack of clarity, de Blasio said, "What I can tell you for sure, I've spoken to Speaker Heastie today and yesterday. He has, and the Assembly has, consistently supported the interests of New York City." It appears that de Blasio and others are again depending on Heastie to be the strongest defender of New York City during "three men in a room" negotiations with Cuomo and Senate Majority Leader John Flanagan, a Republican. "I spoke to the governor this morning, and I still don't have real answers," de Blasio said Monday. "There's no budget language." Cuomo's Executive Budget, unveiled in January, caused concern for de Blasio on several fronts, including hundreds of millions of dollars in proposed CUNY and Medicaid cost shifts to the city. The governor also upset de Blasio by proposing a new layer of state approval in the process by which the state allocates federal affordable housing bonds to the city, among other measures de Blasio and his allies have been fighting. "[T]here have been voices speaking out since February saying that the city should not suffer cutbacks when it comes to CUNY and when it comes to Medicaid," de Blasio said Monday. "We shouldn't have our affordable housing efforts undermined by needless bureaucracy. We should get more support in our efforts to end homelessness - these issues have been talked about now for months and months." "This is supposed to be one of the decision days," the mayor added, referring to the fact that state budget bills would need to be printed Monday in order to have the required three-day aging period so that they can be voted on and passed by Thursday night's deadline. No deal has been reached, no bills were printed, so the governor is likely to issue "messages of necessity" to waive the aging period. 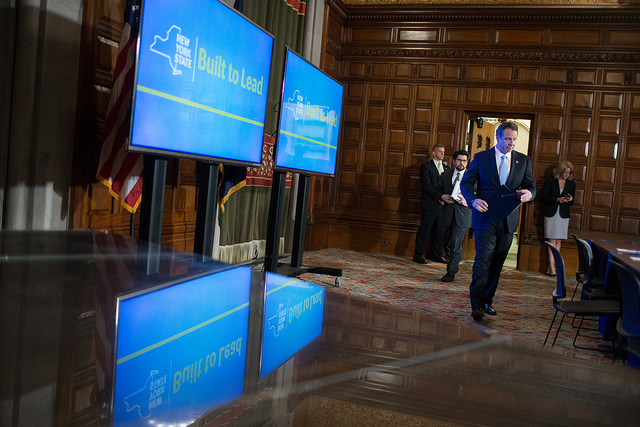 Cuomo has prided himself on leading a new era of on-time budgets and more functional and responsible government. The governor told reporters on Friday that he is reluctant to use messages of necessity, but that he does when needed. While the governor, whose tenure began in 2011, has indeed shepherded through on-time budgets (last year's was technically late by a few minutes), state government remains dogged by corruption scandals. Last year saw both legislative leaders convicted on federal corruption charges in separate cases. Cuomo, who vowed to clean up Albany and has not been able to, unveiled an aggressive ethics reform plan in his January State of the State address, but has said little about it since and all parties have indicated that ethics will not be part of the budget. Asked about whether he is troubled that ethics reform won't be taken up in the state budget, de Blasio said Monday, "I want to see ethics reform in Albany." Citing "public financing of elections and obviously a lot more disclosure," de Blasio said state lawmakers must act, but he cut Cuomo, Heastie, and others slack in terms of when. "Whether it happens now or it happens in the legislative session is less important to me than the fact that it needs to happen," de Blasio said. On more urgent budgetary matters, after months of questions Cuomo's office said last week that it was tabling the CUNY cost shifts, but that it would be appointing a monitor to find efficiencies in the joint city-state system. It was a message met with some relief at City Hall, but de Blasio still said Monday that he wants to see budget language. "There's no confirmation or guarantees related to CUNY, related to Medicaid or any of these other issues," de Blasio said, sounding at least a little frustrated. "And the things I talked about back in February when I gave my budget testimony in Albany, I talked about the fact that the State was going to take away some of our sales tax revenue in a way that we thought was arbitrary and unfair, and now things have been resolved on that front. So I want to see action, and I want to see real language that we can take to the bank right now." De Blasio continued: "You know, the same reality as the day after the governor's State of the State is true. He said none of this would cost New York City a penny and I said I will hold him to it. I'll take a man's word but I'll hold him to it, and I'll still hold him to it because as of this moment, there are no guarantees and we need them. The people of New York City need those guarantees." A spokesperson for Governor Cuomo declined to comment in response to de Blasio. On other issues of concern to the mayor, it appears both mayoral control of city schools and a renewed property tax break to incentivize affordable housing development will have to wait for the legislative session after a budget is settled. The governor proposed a three-year extension of mayoral control, which expires in June, but Senate Republicans have rejected both that proposal and the Assembly Democrats' call for a longer extension. Last week, the Senate announced it would be calling de Blasio to testify at two May hearings on his education leadership. There's been almost no talk of a new 421-a program, or something like it, to spur affordable housing development through tax abatements. The expiration of the previous system is one of the key sources of tension between de Blasio and Cuomo. In Albany, de Blasio has had to rely on Heastie, the Bronx Democrat thrust into the Speaker's chair last year when Sheldon Silver was indicted on the federal corruption charges that led to his conviction. On Monday, de Blasio credited Heastie and other Assembly Democrats for sticking up for the city, as Silver was infamous for doing. The Assembly, de Blasio said, "fought hard to make sure that there would be no cuts to our budget in terms of CUNY and in terms of Medicaid; there would be nothing that would stand in the way of our efforts to create affordable housing. The Assembly and its one house bill went out of its way to say the State would have to do more to help us deal with homelessness. So the Assembly has been very consistent." Once de Blasio sees the details of the state budget, he'll have to adjust his city spending plan for fiscal year 2017 accordingly. De Blasio's preliminary $82 billion spending plan, which did not account for the CUNY and Medicaid cost shifts, is in the midst of a series of City Council hearings. The city's fiscal year begins July 1. Further north, Heastie said a few words Monday to reporters trying to find out how the closed-door budget negotiations were going. 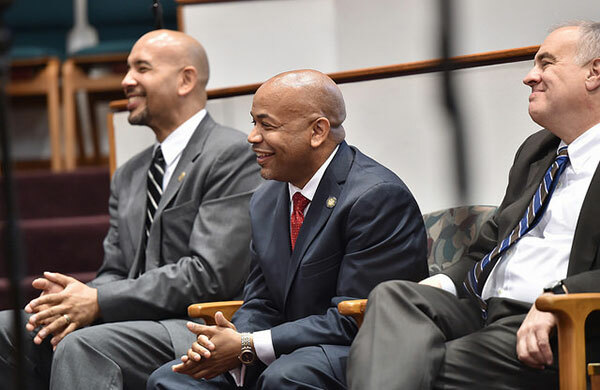 "Albany is the art of the compromise," Heastie said in the capital on Monday, adding that the big-ticket items of minimum wage and paid family leave are being debated. Cuomo's two major policy priorities - both of which de Blasio supports - have taken center stage, though many other smaller issues could become part of a larger compromise by the time the budget is announced. "I think in some regards we are able to move forward," Heastie said, "but there's still some outstanding issues about how the City of New York comes out of this." Gov. Andrew Cuomo's budget proposal to have New York City take over $485 million in funding for CUNY still has a number of legislators and advocates on edge despite the administration's repeated attempts to quell concerns. Advocates and faculty held a "die in" at Cuomo's New York City office on Thursday afternoon and a number of legislators say they remain ready to delay the state budget and vote against it should CUNY face any cuts, or cost shifts. 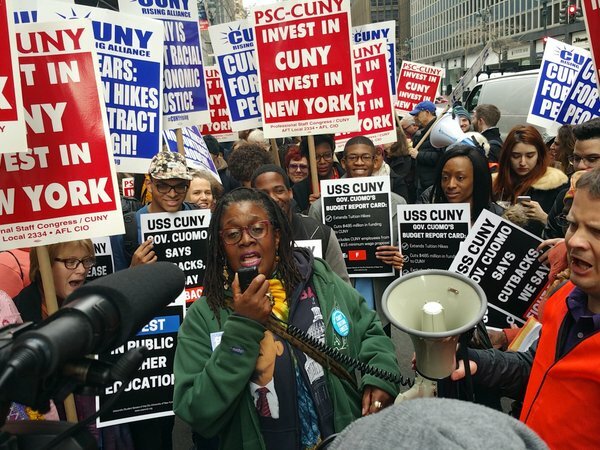 "The governor has said the CUNY budget won't change and I am here today to hold him to his word," Barbara Bowen, president of PSC/CUNY, the system's main labor union, told Gotham Gazette before Thursday's protest. Bowen said the administration had reached out to her and was "insistent on their message." More than 40 protesters were eventually arrested at the rally, which was over general cost shifts, a push for increased funding, and the expired faculty union contract. Facing backlash for the cost-shifting proposal after he unveiled it in January, Cuomo said that the state budget wouldn't "cost CUNY a penny" and that his administration would team with City Hall to find "efficiencies." However, when the time for 30-day amendments to the governor's fiscal year 2017 budget proposal rolled around, the proposed cost shift remained. The de Blasio administration has indicated it has yet to have detailed discussions about savings with the Cuomo administration. CUNY is a joint city-state system. "It is appalling that the faculty union and for-hire political advocacy groups are knowingly misleading their members and the public to score cheap political points." Cuomo spokesperson Dani Lever told Gotham Gazette. "We have said repeatedly and unequivocally that CUNY will receive its full $1.6 billion in state aid this year. Further, the Governor has urged CUNY and its faculty union to resolve their current contract negotiations. The fact that these groups are ignoring reality is alarming, irresponsible, and a flagrant disregard for the students they claim to advocate for. Rather than using unfounded and untruthful scare tactics to lie to the public, they should support the Governor's fight to direct more funding to students instead of administrative costs." Lever did not respond to questions about whether the de Blasio administration was involved in finding efficiencies at CUNY. De Blasio's team also failed to respond to a request for comment. When asked recently, de Blasio has only said in general terms that he and his aides continue to talk with the governor and his team. As outcry mounted earlier this month, Cuomo and State Director of Operations Jim Malatras said they will hire a management expert to find cost savings in management at CUNY and SUNY. Cuomo stressed that the administration was looking to shave administrative costs at CUNY during a press conference in Manhattan on March 17. "These are back office savings," Cuomo said. "They have nothing to do with students in classrooms. As a matter of fact, if you reduce the money you're spending in the back office, you can do better and do more with students." Some legislators say they have approached the administration for clarity. They have asked questions about what Cuomo's intentions are, whether the management expert precludes negotiations with the city, whether the administration is still looking for the city to pay more of a share of CUNY costs, and whether a $240 million pot of cash Cuomo put aside in his budget to help cover retroactive pay raises for CUNY staff would remain if the operating cost transfer is restored. They say they were referred to previous statements and not given any particular clarity on the situation. When asked about the $240 million for retroactive raises administration officials said that it was "out of our hands" because CUNY is in mediation with its union. They further indicated that all interested parties are involved in looking for efficiencies at CUNY, but that the current plan is for a management expert to look for efficiencies to be included in next year's budget (fiscal year 2018). "This year's executive budget proposal ensures that CUNY will receive full funding," said Malatras in a statement sent out on March 16. "The $1.6 billion in aid it receives has not changed, and will not change under this budget. The funding stays constant. CUNY supports hundreds of thousands of students, many of whom are new to our state or our country, or are the first in their family to attend college. The Governor's commitment to supporting those students and the institution that serves them could not be stronger, and his budget proposal reflects that reality." The question is not necessarily whether CUNY will be fully funded, but whether the state budget will indeed shift hundreds of millions of dollars in CUNY costs onto the city. The implications of that shift are not immediately clear - the de Blasio administration insists it would be devastating. Some rank-and-file legislators who aren't privy to the backroom budget negotiations among Cuomo and majority leaders of the two houses harbor a deep mistrust of the administration's plans. They see the proposal as an attack on the city, motivated by the governor's feud with de Blasio, as well as a negotiating tactic that gives Cuomo more leverage over Assembly Democrats. "Actions speak louder than words. We have a document that we have to deal with that tells us CUNY is going to be cut by nearly half-a-billion dollars," Sen. Gustavo Rivera, a Bronx Democrat, said of the governor's budget proposal. "It may be off the table but we don't know. They didn't take it out of the budget with 30-day amendments, so as far as we're concerned it's in play." The Assembly, which is controlled by Democrats, did not include the cost shifts in its one-house budget. The Republican-controlled Senate's budget supports Cuomo's cost shift. De Blasio opted not to include the shifts in his preliminary city budget proposal, saying that he was taking the governor at his word that the "efficiencies" wouldn't cost the city any money. The state budget is due by April 1, the city budget by July. 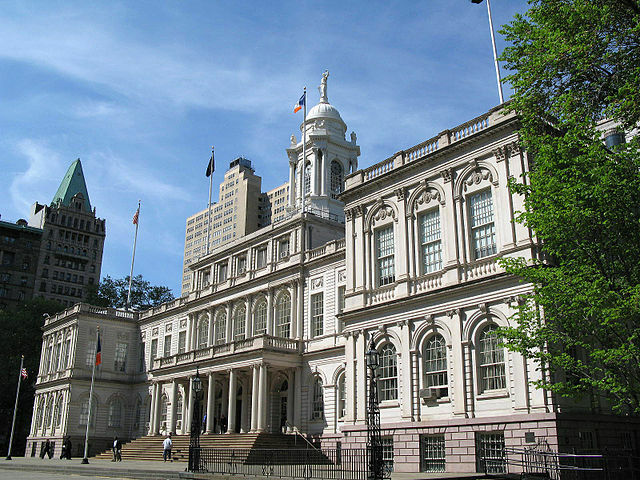 Malatras told The New York Times in a recent interview that the governor's proposal was a negotiating tactic to get City Hall and CUNY to take reforms seriously. "The only way you compel change sometimes is where you put financial skin in the game," Malatras said. "You don't start a conversation by punching someone in the face." Sen. Rivera countered. "We are talking about a cut to an essential service that provides people with a future. CUNY serves 70 percent students of color and 40 percent immigrants. I'm not sure why anyone would put it in the budget. You don't start a conversation by saying 'Here you have to come up with $485 million to fund an essential service.'" Assembly Speaker Carl Heastie, also a Bronx Democrat, has been adamant that the governor's proposal will not remain. "It looks like the Cuomo administration was wishing, hoping, praying that City Hall was going to pick up the tab," said Sen. Liz Krueger, a Manhattan Democrat who has been outspoken against the cost shift. Krueger said she now believes the proposal is off the table but said, "I think people should be concerned." Advocates and legislators say that Cuomo's proposal has created outrage and debate about education funding that they doubt the governor anticipated. "This has sparked a public conversation about CUNY," said Bowen. "But that conversation won't be adequate if all it decides is whether it will be cut and funding is restored to where it was. Because the state funding level is not adequate." Bowen said that state funding for CUNY remains at "recession levels." She and her allies are now pushing for several budget demands. They say per-student state funding has fallen by three percent under Cuomo. "I hope to see a final enacted budget with no cost shift," Bowen said, "that also includes at least $240 million for retroactive raises, that freezes tuition, and has provision that will have state funding increase every year to be constant with inflation." This week will be another busy one when it comes to budgets: the City Council continues its preliminary budget hearings and state budget negotiations enter their final ten days - a state budget is due by April 1 and some say a deal could be announced before the end of this week. Don't count on it, though, state budgets usually come in just before (or, as was the case last year, just after) the March 31 midnight deadline. 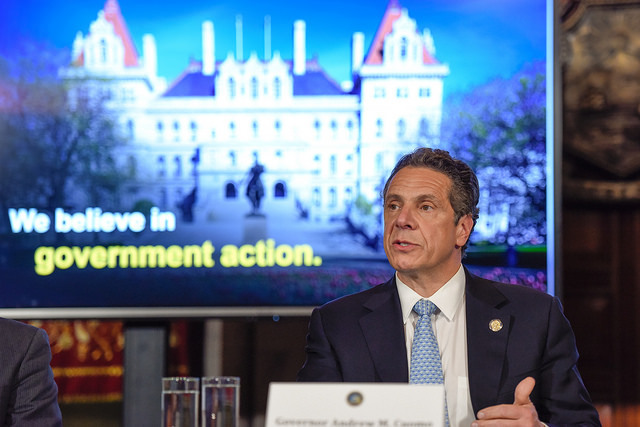 This practice under Governor Andrew Cuomo is actually a serious improvement given that the state used to regularly wind up with late budgets extending weeks past the start of the new fiscal year, which begins April 1. There are a variety of issues to be worked out, with several of importance to New York City. As always, there are a number of high-profile items, like an increase of the minimum wage or government ethics reform, that could be pushed beyond the budget and into the legislative session to follow. That session runs until mid-June. The budget, after all, only must include necessary state expenses. Expect at least a couple of closed-door meetings among Cuomo and the two legislative leaders, Assembly Speaker Carl Heastie, a Democrat, and Senate Majority Leader John Flanagan, a Republican. On Monday, City Council "Speaker Mark-Viverito and Council Members will travel to Albany to advocate for the City Council's 2016 State Budget and Legislative Agenda," according to Mark-Viverito's public schedule. Also worth watching in Albany this week, the Assembly will consider internal reforms announced by Heastie and his conference at the end of this past week. The 40-plus reform proposals received a mixed reaction from elected officials and good government advocates, but still indicate a number of changes that many have been advocating for years. And, keep an eye out for a related conference in Albany on Friday, which will look at ethics reform through the lens of a state constitutional convention - details below. While it is another busy week of budget hearings at the City Council, the Council will also hold a full-body Stated Meeting on Tuesday, at which new bills will be introduced and the Council will vote on the two high-profile zoning changes - Mandatory Inclusionary Housing (MIH) and Zoning for Quality and Affordability (ZQA) - that have been the source of months of discussion, negotiation, and controversy, and that are key to Mayor de Blasio's affordable housing plans. Mayor de Blasio is doing a series of six media appearances to discuss his affordable housing agenda on Monday. He'll be on NPR, 880AM and 710AM radio, and on NY1, NY1 Noticias, and Univision TV. At 10 a.m. in Albany, following the full meeting of the NYS Board of Regents, the board’s newly-elected Chancellor and Vice Chancellor will hold a press conference with the State Education Commissioner MaryEllen Elia. At noon Monday, a coalition of over 90 HIV/AIDS advocates will launch a statewide Week of Action on the steps of City Hall, calling upon Governor Cuomo to invest $70 million in a plan to end AIDS in the 2016 New York State budget. At 9:30 a.m., the Committee on Health will hold a hearing on a bill to prohibit the use of smokeless tobacco products at sports arenas and recreational areas that require tickets. At 10 a.m., the Committee on Health will meet for a preliminary budget hearing. At noon, the Committee on Consumer Affairs will meet for a preliminary budget hearing. At 1 p.m., the Committee on Youth Services will discuss a bill requiring the establishment of a training coordinator to teach certain agency staff throughout departments such as Parks and Recreation, Homeless Services, and Human Resources Administration/Social Services how to identify runaway, homeless or sexually exploited youth and how to connect them with appropriate services. The committee will also discuss several technical changes relating to an annual report produced by the Administration for Children’s Services and the Department of Youth and Community Development on the number of sexually exploited youth each agency has come into contact with over the course of the calendar year. At 1 p.m., the Committee on Public Safety will meet for a preliminary budget hearing. At 1:30 p.m., the Committee on Higher Education will meet to discuss a resolution to increase State funding to CUNY, and to reach a fair labor agreement with the University’s faculty and staff in the 2016-17 NYS Executive Budget. At 3 p.m., the Committee on Civil Rights will examine a bill to broaden or incorporate a right to truthful information for a variety of activities covered by the New York City Human Rights Law, including lending, employment, and access to public accommodations and others. At 2 p.m. Monday, "First Lady McCray will deliver opening remarks at a panel at Fountain House, an organization dedicated to supporting those living with serious mental illness." At 6 p.m. Monday, the LGBT Task Force of Manhattan Community Boards 9, 10, 11, and 12 will host an LGBT Resource Fair featuring New York City Agencies. The event is sponsored by Manhattan Borough President Gale Brewer and City Council Speaker Melissa Mark-Viverito. 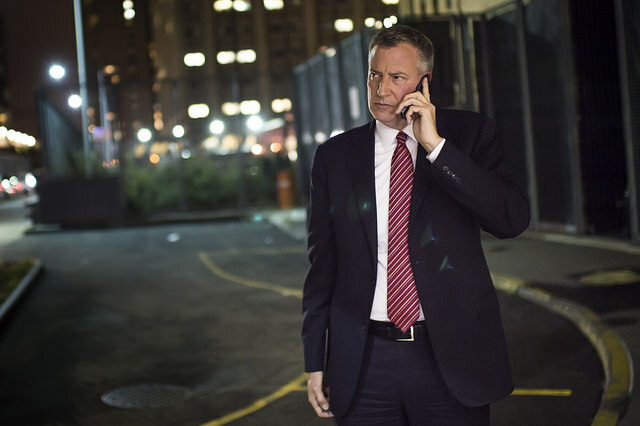 At 6:10 p.m. Monday evening, "Mayor Bill de Blasio will discuss affordable housing with an anticipated 10,000+ AARP members from New York City on an interactive call that allows participants to ask questions," according to AARP-NY. On Monday at 6:30 p.m., schools Chancellor Carmen Fariña will attend a town hall meeting of District 16's Community Education Council at MS 267 in Brooklyn. At 8:30 a.m. Tuesday, Crain’s New York Business will host an event on how startup businesses take off in New York City, featuring: Gregg Bishop, Commissioner, NYC Department of Small Business Services; Howard Lerman, Co-Founder & CEO, Yext; Rachel Shechtman,, Founder and CEO, STORY; Adam Shwartz, Director, Jacobs Technion-Cornell Institute at Cornell Tech; and moderated by Matthew Flamm, Senior Reporter, Crain's New York Business. At 8:30 a.m. Tuesday, the YWCA of New York City will host “its third breakfast panel for Women’s History Month “New York City Women Leaders: The Power of Influence and Purpose.” The panel will include Maya Wiley, counsel to Mayor Bill de Blasio; City Council Member Elizabeth Crowley; and Carmelyn Malalis, commissioner of the city’s Human Rights Commission; among others. At 10 a.m. Tuesday, the Commission on Public Information and Communication will meet to discuss the implementation of the webcasting law and the establishment of a central portal for webcasts. At 9 a.m., the Committee on State and Federal Legislation will meet to press for authorization that Christopher Park in Manhattan is discontinued as city parkland. At 10 a.m., the Committee on Finance will meet to approve new designations for certain organizations to receive funding in the expense budget; to communicate the transfer of City funds between various agencies in FY ‘16 in the expense budget; and to communicate the appropriation of new revenues of $982 million in FY ‘16. At 1:30 p.m., the City Council will hold a full-body Stated Meeting. The highlight of the hearing will be the Council’s votes on the MIH and ZQA zoning text amendments. Before the Stated, City Council Speaker Melissa Mark-Viverito will host a pre-Stated press conference at 12:30. Also prior to the Stated Meeting, at noon, City Council Members Costa Constantinides and Ydanis Rodriguez will host a press conference on the steps of City Hall to rally before introducing a bill to create a pilot program for electric vehicle charging stations on street parking. The program hopes to encourage the use of electric cars and reduce carbon emissions citywide. At 10 a.m., the Subcommittee on Libraries will meet jointly with the Committee on Cultural Affairs, Libraries and International Intergroup Relations for a preliminary budget hearing on libraries. At 11 a.m., the Committee on Contracts will meet for a preliminary budget hearing. At 1 p.m., the Committee on Courts and Legal Services will meet for a preliminary budget hearing. At 5 p.m. Wednesday, City Council Speaker Melissa Mark-Viverito will host a Women’s History Month celebration at Mott Haven Library. At 8 a.m. Thursday, the Manhattan Chamber of Commerce will host a breakfast event focused on combating the rising tide of cybercrime and featuring Manhattan District Attorney Cy Vance. At 1:30 p.m. Friday in Albany, a forum, “Can a NYS Constitutional Convention Strengthen Government Ethics?” The event, hosted by The Rockefeller Institute, will feature discussion about whether issues of integrity in government can be fixed statutorily, or if would be better resolved through constitutional change. Speaking will be former NYS Comptroller H. Carl McCall; and Columbia Law School Professor Richard Briffault, who is also a former assistant counsel to Governor Hugh Carey; as well as a panel of experts. On Saturday, March 26, Participatory Budget voting begins in New York City Council districts running the program. In Participatory Budgeting, Council Members ask New York City residents “to decide how to invest public funds in their neighborhoods.” Voting will take place throughout the nearly 30 participating districts through April 3.